Any visit to Quartzsite, AZ is not complete without a trip out to the Desert Bar. It can be reached at the end of a 5-mile dirt road, but several of us decided to be really daring and take the 4-wheel drive road. I'm sure glad I wasn't driving! It appears some people didn't make it at all. I didn't get pictures of the worst parts, because I was too busy holding on! Finally, we arrived and our leader found a good parking space. The bar is located on land that was an old mining camp. We got there pretty early, so we had seats right on the dance floor. They have a limited menu, and if you want any condiments other than ketchup and mustard, you'd better bring your own. The bar stools are old tractor seats. Don't you love my 10X zoom? The place has expanded in the last few years. This year they even have better food available downstairs. Notice the 48 solar panels? That is their only source of electricity. You just have to wonder about the story here. There is a "church" here, completed in 1996, that is a popular place for weddings, but it has only one wall. Watch out, Silly Al's (up until now THE place to get a pizza.) There's a new pizza place in town, the Ladder Truck Pizza Company, an old fire truck turned into a pizza cooker. Another odd food vendor is this ice cream place, where the ice cream is made with this 1-cylinder machine. New vendors in Tyson Wells, the outdoor flea market area in Quartzsite, include a Pink Store, where they were even selling a pink tool chest, complete with pink tools. This guy was making any sign you want out of old license plates. Very clever. Here's a new booth catering to them. I always thought it would be much better to clean a dog's teeth without anesthesia. It was about $100 compared to the $300 or so it costs with anesthesia. And he was cute too! RVers can't go anywhere without discussing black water problems. Well, here's someone who will take care of that. And yet another company willing to take away "Yesterday's Meals on Wheels." On Saturday, the "Big Tent" opened. There's quite a crowd, but let's see if we can find some new stuff. This was kind of clever - a stretchy material that goes around your wrist and hold both you cell phone and credit cards. This one I actually bought. RV Frames that stick to any flat surface in your rig, hold a picture, and can be removed and used elsewhere without leaving any sticky residue. This one was new and fairly strange. I don't know whether they sold any. A Bidet Kit for your RV toilet. 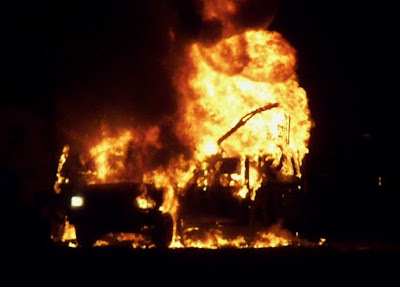 A few days ago, one of my WIN friend's rig burned up. We were pretty far away from the fire station, but the fire truck eventually got here. I was kind of surprised that they had only water, and not foam. It took a long time to get the fire out. 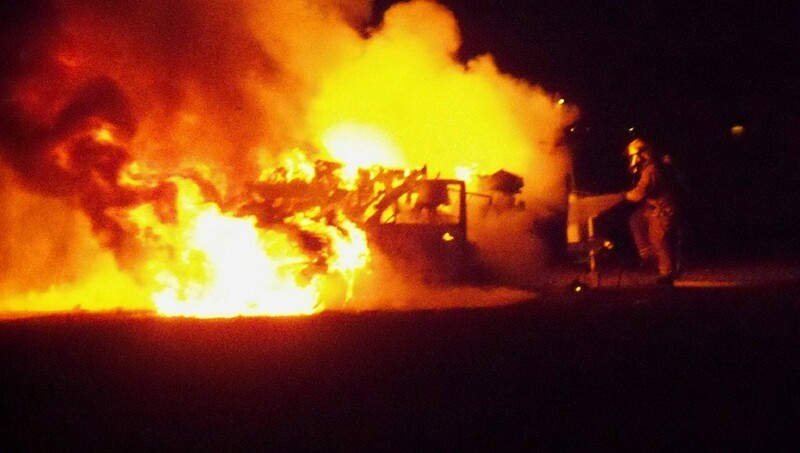 Another rig nearby was damaged by the heat, but thankfully no one was hurt, and no pets were lost. This is all that was left of her little Class C. Amazingly, she managed to find her wallet in the debris. 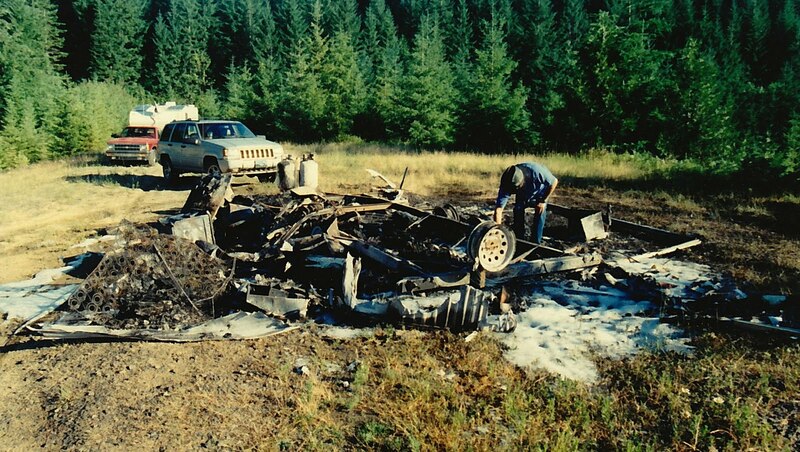 This hit really close to home, since I had a rig burn in 1999. Afterwards, you go through a lot of "What if I had..." and "I should have." While nothing can really prevent fires, I thought I'd tell you what I've done to lessen the chance of that ever happening again. First of all, I got a bigger, better fire extinguisher. This one is a 2-liter foam one that will put out wood fires. Can you believe that the small extinguishers that come with your rig are rated "BC" for grease and electrical, but not "A" for wood! What do they think RVs are made of?!? Second, all the wires that connect to my battery are fused. This gigantic 200-amp fuse is for the connection to my 1750-watt inverter. I have 240-watts of solar power, going through a 30-amp fuse. And another 30-amp fuse protecting the batteries from the DC load going through the distribution panel. That you can buy for about $2. Now, this third idea is purely my own crazy idea. After my fire, I kept thinking I could have put it out when it first started if I had had a bucket and a lot of water. So here's my bucket, in an outside storage compartment, but I need a quick source of water. And here it is! The grey water will pour out quickly by pulling the handle on the left, and if needed, the black water handle is on the right. I'm not suggesting anyone risk their life, but when a fire is just starting, I think it would work. P.S. After I did this post, Phil bought a new fire extinguisher. 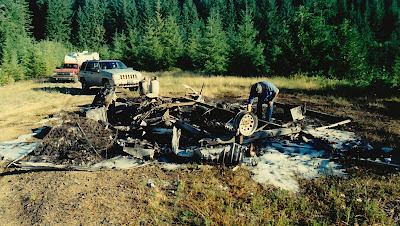 It's a Cold Fire - the same agent used in auto racing. It puts out fires 21 times faster than water! It's a little pricey, but worth it. I've written more on fire prevention here. Quartzsite is one of my favorite places to go during the year. Back in 1998, I was still working (very hard during tax season) and wondering if I would ever get here. My friend Marie invited me to fly out and stay with her so I could experience it. Coming over the rise on I10 from Phoenix, I wondered what all those white things were. They were RVs! Amazingly, I am now at my 13th Quartzsite gathering! But let me digress a little first - I want to congratulate my nephew Mike and his wife Tara on little baby Will. Mike and Tara have been through so much to get to this point! 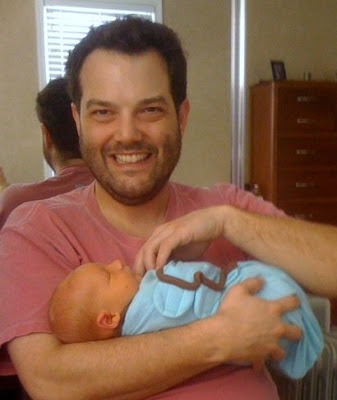 I can't wait to hold my new great-(or grand-?) nephew. 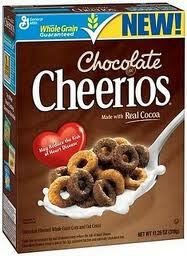 And another digression - Chocolate Cheerios! I am pleased to announce that I am the winner of one of Paul and Marti's famous "Where Am I" contests. I'll pick up my prize in the spring when I am close to where they live. I'm looking forward to meeting them. Back to Quartzsite - one of the first things I did was go to the free lunch at La Mesa RV. They are determined to show that there IS such a thing as a free lunch! They are located in an old dance hall and the ceiling is covered with well-used boots. Back in my rig, I seem to have a lot of these little buggers running around. Does anyone know what they are? This is the largest WIN gathering of the year - we have 175 members here. In the morning we meet for "Hugs and Mugs," many times being buzzed by the nearby ultralights. And every day at 4:00 we have our gathering. Judy is hosting the February Dance Rally this year and decided to spice up the promotion - a Hawaii theme this year. To the unusual pink and blue that I first saw here 13 years ago. Besides abundant recycling, "dumps" are now referred to as "landfills," and are highly regulated. Right next to Kurt's house in Wellton, AZ, is the Copper Mountain Landfill, where all the Yuma trash is taken. Last year, Kurt arranged for a tour, and it was so interesting that we all insisted he do the same this year. 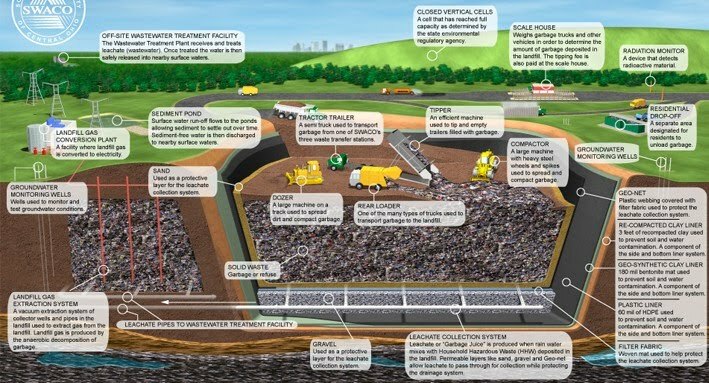 This is a drawing of how a modern landfill is made. You might have to click on the picture to read the captions. Our first stop was the site of the next area to be filled. 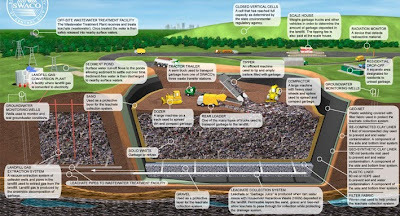 The whole area is sealed with a thick thick plastic liner, to create an inpenetrable barrier between soil and groundwater and what goes into the landfill. The liner is then covered with soil and a layer of "fluff," gargage used as a protective layer so that the heavy equipment does not break through the plastic liner. The "fluff" is then spread out with less-heavy machinery. We then went over to the section currently being filled. This truck pulled up with barrels of some kind of non-toxic waste. The driver was told to move the rear axles of the trailer back to the very rear, because the trailer looked like it was rusty and might break. He then disconnected the trailer and dumped his stuff. If you are in a hurry, skip forward to :35 in the movie. Then the heavy-duty trash compacters went to work. We were told that it was Vitamin E in the barrels. Maybe it was out of date. Kurt put on a great gathering. And every night we had a gorgeous sunset!